This new iTCosmetics foundation is seriously my new holy grail foundation! 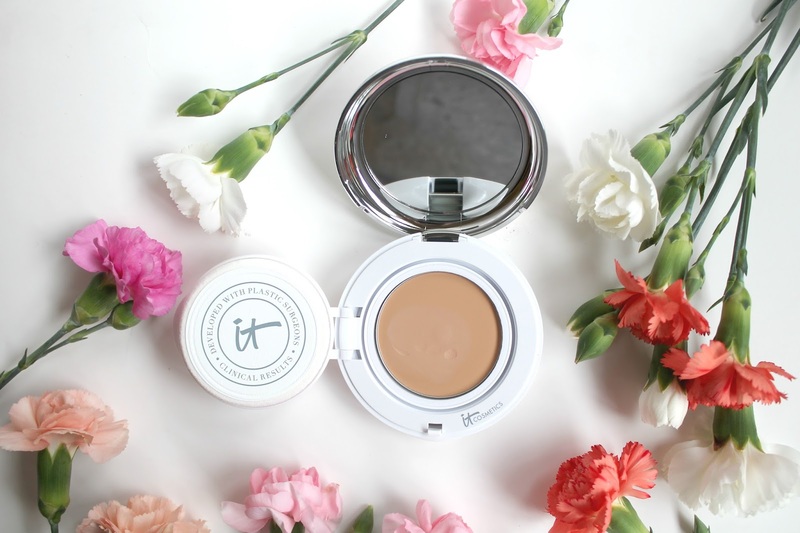 I have been a long time user and lover of iTCosmetics and I am always incredibly excited to try their new products out. This foundation is full coverage with SPF which I love because I don't have to bother with another layer of product on my face to get my sun protection. It feels like I have nothing on my face and literally looks like my skin, just a million times better! I am so in love with it. The fact that it has anti-aging skincare in it is just another bonus. I'm not really sure how this product could be any better, honestly! I highly recommend it. If you've been following me for awhile you know for my hair care I am a huge OGX Beauty and Aveda hair care lover. I almost exclusively use their products, but I've been wanting to try out some new things lately. 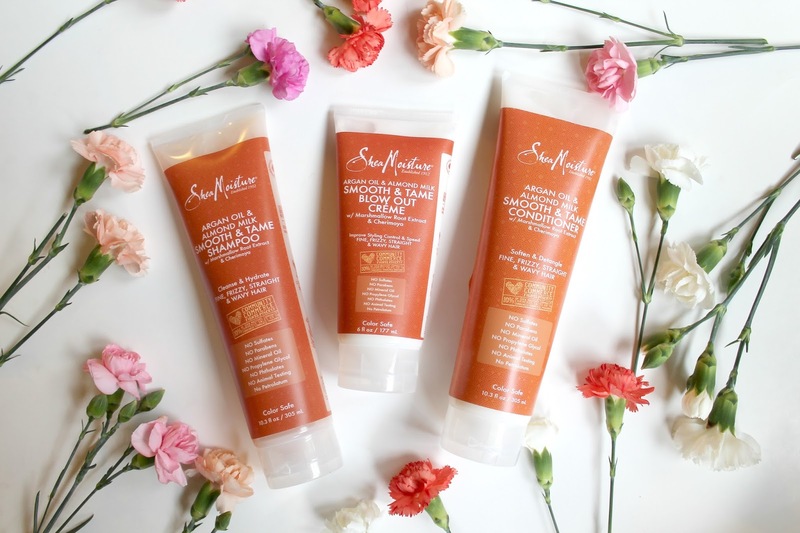 I stumbled upon the SheaMoisture Argan Oil line and I am obsessed with these products! First of all, they smell amazing! I really really love the smell. I also love that they are free of so many harsh chemicals as well. I love using products that are paraben free and appreciate that they have none in their formula. I've been using this shampoo and conditioner twice a week and have really noticed my hair being less frizzy and more silky, which is exactly what I want. I have really dry and thick hair that easily gets frizzy for reference, so anything that can help with that is amazing. I also really love using the Blow Out Creme before I straighten my hair or if I'm doing a slicked back hair look because it tames my fly-aways all day long! I've been loving my skincare lately and have been trying out some new products. These tulasara masques from Aveda are really helping to brighten my face complexion. It's giving me a more youthful look to my skin! The eye masque has really helped reduce my under eye circles and tighten the skin around my eyes too. I've been getting dry patches under my eyes lately and this masque has really helped reduce them. It makes my under eyes feel and look better & makeup applies better too! Before I put on my makeup in the morning, I always cleanse and moisturize my face. The moisturizer I had been using was a little too heavy for the mornings so I've been on the hunt for something new to try. I really wanted a moisturizer that would keep my face hydrated all day long without being too thick so I could apply my makeup shortly after moisturizing without getting any dry patches throughout the day. 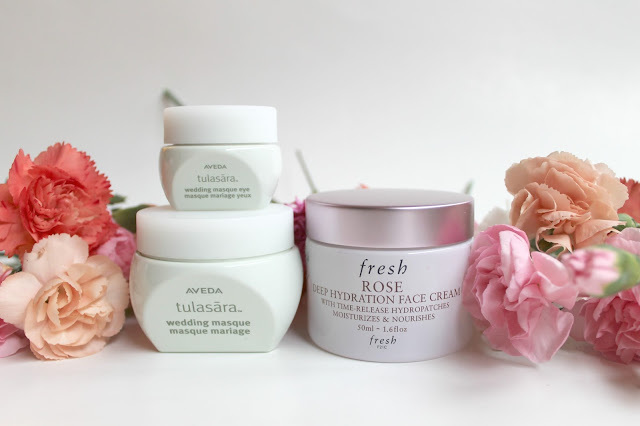 I found this rose moisturizer from Fresh and it was exactly what I was looking for! I love that it is lightweight and sinks into my skin quickly, yet keeps my extremely dry skin moisturized all day long. It's the perfect day cream for me! I hope you enjoyed reading about some of the new beauty products I've been trying! Thanks so much for stopping by! *All of the products mentioned were provided c/o, but all opinions are my own. Definitely going to try that Shea Moisture line. I've tried every single one of their other lines and love them.